If you want to book a room use the Booking Widget on the top of the page. If you plan to pre book surf lesson, surf rental, motorbike rental during your stay at our resort, or for any special request, please contact us by email or phone, or by using the message tool beside. For all demands concerning scubadiving, freediving, snorkeling, island hoping, moto rental, restaurant/bar reservation or events, please contact us by phone, email or using the message tool beside. We aim to answer all messages the same day that they are received; if you need to speak with someone more urgently, please contact us by phone. When contacting us for diving activity, please provide as much information as possible on your intended stay with us as possible, you can include information such as your diving certification, number of dives, experience, date of last dive and your travel dates. 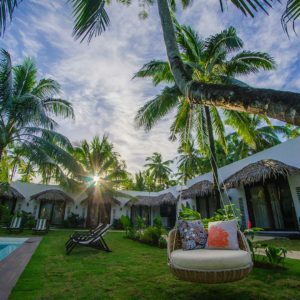 Palaka Ocean Adventure Resort is located in Siargao Island, between General Luna and Cloud 9, amongst other resorts and restaurant on the Tourism Road. 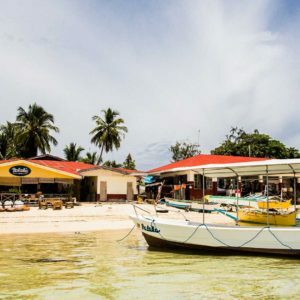 Palaka Dive Center and Beach Bar/Restaurant is one kilometer away from the resort towards the center of General Luna. It is located inside the marketplace, beachside with a beautiful ocean and islands view. Direct flights from Cebu, Davao, Manila and Angeles with Cebu Pacific, Skyjet and Philippines Airlines. 5 – 7 flights a day. For your immense convenience, transfers from Sayak (Siargao) airport to General Luna can be arranged by our resort. There is also a possibility to reach Siargao Island by boat, coming from Surigao City. Boats leave Surigao City from 5 am to 12:00 pm. It takes between 2h30 and 4h to reach Dapa on Siargao Island, depending on the boat and on weather conditions. Be careful, no afternoon or evening boat. Because most activities and businesses are located in a 10 km long area between Malinao, General Luna and Cloud 9, most of visitors are renting scooters during their stay. Please inform us if you want to pre book a scooter or motocross with us. Discounts applied for guests from our resort and our dive center. If you want to book a room use the Booking Widget.